Language Matters! Communication, identity, education, and action- language is in all things. 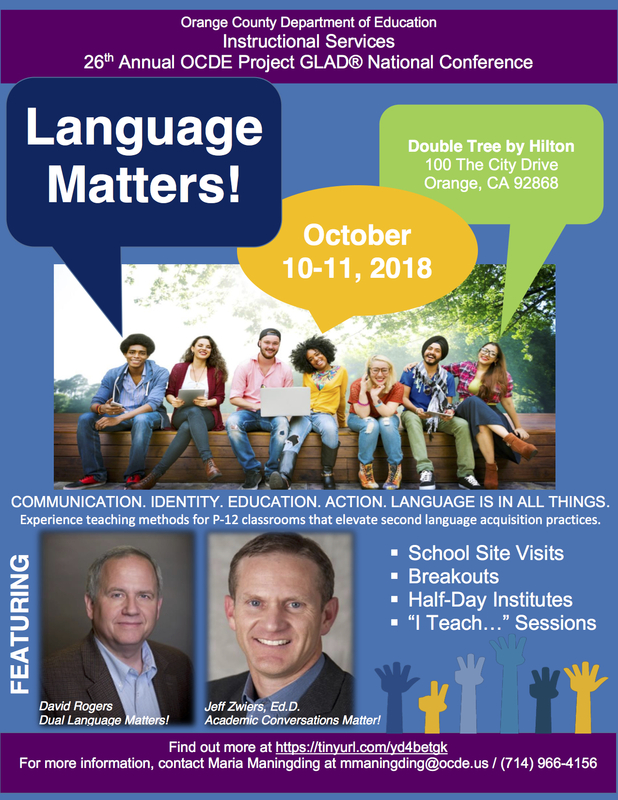 The annual OCDE Project GLAD® NTC Conference provides the space for thought-provoking conversations about multilingual education, diversity, culture, and educator impact. Often, we understand the theory of language acquisition or integrated and designated ELD, but the HOW remains elusive. This conference will provide you and your teachers with practical methods on how to make language evident in the classroom. Come experience teaching methods for P-12 classrooms that elevate language acquisition practices for all students, particularly English Learners, via the OCDE Project GLAD® (Guided Language Acquisition Design) model. Be part of the conversation and define your own path for supporting students and teachers. For conference questions, please contact: Christie Baird at cbaird@ocde.us or (714) 327-8181. Take a look at the brochure about the event!